Acronym for Royal Canadian Air Force. On April 1, 1924 the Royal Canadian Air Force became a permanent component of the Canadian defense establishment. Until 1936 it was involved in civil air operations including Forestry patrols, anti-smuggling, forest spraying, and surveying. During 1936 it dropped its civilian functions with the exception of aerial photography and was brought under the auspices of the newly formed Department of Transport. Three military squadrons, were created and based at RCAF Station Trenton, Ontario which had been used since 1931 as the main training base. In December 1938 the RCAF became and independent arm under the Minister of National Defense. By January 1944 the RCAF had 215,200 members of all ranks. 104,000 were in the British Commonwealth Air Training Plan, 64,928 were serving at home and 46,272 were serving overseas. There were 78 squadrons in service, 35 of them overseas and 43 at home. Of the 215,200 members, 15,153 were women. During 1955 the RCAF reached a peak of 29 Regular and 12 Auxiliary flying squadrons. Commencing in 1962, the CF-100's were withdrawn from operational service and replaced by fewer CF-101 Voodoos. CF-104 Starfighters also replaced the aging Sabres from the Air Division in Europe. 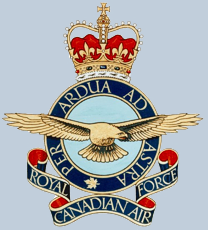 In February 1968 the RCAF ceased to exist as a separate and independent force and the 18 operational RCAF squadrons were integrated into the Canadian Armed Forces. Several command structures were then established including Maritime Command, Air Transport Command, Air Defence Command, Mobile Command, Training Command, Material Command, the Reserve and National Survival; Communications System and Canadian Forces Europe. On July 31, 1997 all previous commands and groups were disbanded and replaced by 1 Canadian Air Division / Canadian NORAD Region with an operations structure based on the traditional wing concept. Twenty Second Wing - North Bay. On August 27 1956, RCAF pilot R. J. Childerhose, was en-route from Gimli, Manitoba, to Vancouver, British Columbia. He was piloting one of four F-86 Sabre jets at an altitude of about 36,000 ft. and a speed of 460 mph. At about 7:20pm while over the Canadian Rockies near Ft. MacCleod, Alberta, he saw and photographed a bright disk shaped stationary object between 15 and 30 meters in diameter. The disc of light appeared to be at a distance of about 3 miles from his position at an altitude of about 20,000 feet. Childerhose had the object in view for over 45 seconds. He reported that it was flat and disk shaped with sharply defined edges, but it was emitting a bright light that overexposed his film, causing it to blur ( left ). 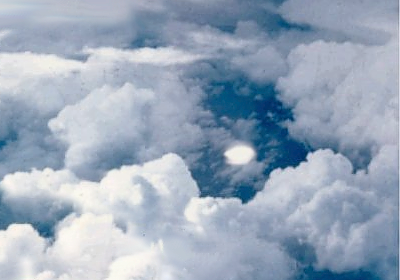 Despite Childerhose's personal testimony, some investigators have debunked the sighting, suggesting it was a plasma phenomenon similar to ball lightning, or merely a reflection off the cockpit canopy. However, photo analyst Bruce Maccabee found no evidence to substantiate that theory. On October 23, 1961, RCAF Air Marshall Hugh Campbell issued a memorandum stating that the RCAF position with respect to UFOs is one of complete open-mindedness. Each reported incident is investigated to the extent that circumstances, such as the apparent reliability and competence of the observer of the incident, seem to warrant. He also stated that the Canadian Government is concerned with any report which might affect national security, but that no UFO reports which have been investigated by various departments of the Canadian Government have revealed positive evidence of anything which might affect national welfare and which could not be attributed to natural phenomena or mistaken identity. He also stated that while UFO reports are not necessarily offered to the news media, they are never denied. During an incident on Sept 13th, 2001, base residents of the Twenty Second Wing at North Bay reported that a massive triangular shaped craft hovered over their base for several minutes. No "natural phenomenon" or "mistaken identity" explanation has been offered for the sighting, and apart from hovering directly over an RCAF base, their was no "positive evidence" that it might affect our national welfare.